Suzanne will be appearing as an “Attending Professional” at DragonCon from August 29-31. Click through to the DragonCon site for all of the DragonCon details. Come for the candy, stay for the stories! On Monday, July 28th, Derek Newman-Stille interviewed Suzanne on his hour-long radio show “Speculating Canada”. Derek asked some fabulous and insightful questions. After listening, you might even have a deeper understanding of the Themes in ELEMENTS. If you’re in the middle of your summer reading, remember that two of the Stop-Watch Gang members have short stories on the final ballot for the Aurora Awards. If you pay the small fee to join CSFFA, you’ll have access to the voters’ package which includes free samples of all of the nominated works. Voting closes at 11:59PM ET, Saturday, September 6, 2014. 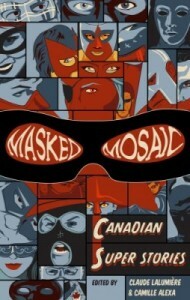 “A Bunny Hug for Karl” by Mike Rimar was published in Masked Mosaic, Canadian Super Stories (Tyche Books). 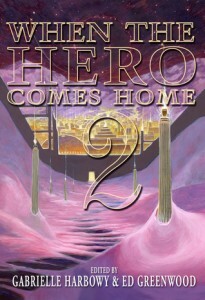 “Living Bargains” by Suzanne Church was published in When the Hero Comes Home 2 (Dragon Moon Press). Follow the “Living Bargains” tab (above) to read Suzanne’s story. Click here for a full list of all the 2014 Aurora Award nominated works. 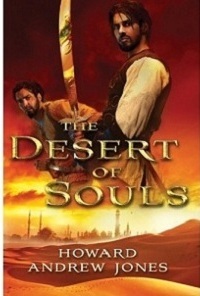 Howard Jones’s debut historical fantasy novel, The Desert of Souls (Thomas Dunne Books 2011), was widely acclaimed by influential publications like Library Journal, Kirkus, and Publisher’s Weekly. 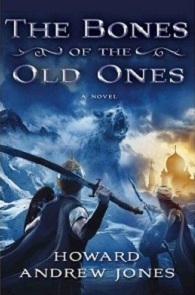 Its sequel, The Bones of the Old Ones, made the Barnes and Noble Best Fantasy Release of 2013 and received a starred review from Publisher’s Weekly. 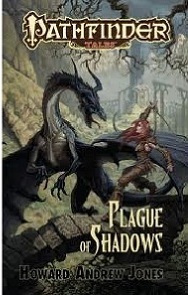 He is the author of two Pathfinder novels, Plague of Shadows and Stalking the Beast (with two more on the way), and an e-collection of short stories featuring the heroes from his historical fantasy novels, The Waters of Eternity. Howard assembled and edited 8 collections of historical fiction writer Harold Lamb’s work for the University of Nebraska Press. 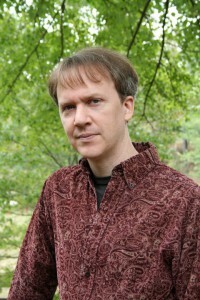 He served as Managing Editor of Black Gate magazine from 2004 until 2013, and still blogs regularly at the magazine web site. Suzanne Church: You’ve written many insightful and personal posts on your blog. One of my favourites is your post on transitioning to a writing frame of mind. Do you use your Invocation of the Muses prayer every time you sit down to write? Howard Andrew Jones: I’m glad you like it. It continues to be one of the most popular articles on my web site, and unlike most of my older posts still attracts new comments. Honestly, I don’t use the prayer every day. But then I guess I don’t use any particular tactic every time I write. I pull out the prayer if I’m having trouble focusing. I always write a copy of the prayer in the first page when I start a new writing notebook, and I always carry my writing notebook (it’s a paperblanks mini so it’s easy to slip in a back pocket). SC: If your characters were real people, which one would you choose to interview first on your blog. Why? HAJ: Probably Asim el Abbas, loyal warrior companion and (later in life) chronicler of the adventures he shares with Dabir ibn Khalil. He’s a biased narrator, and I have a blast writing from his perspective because he doesn’t always see things as they really are. I try to provide clues to readers about what’s really happening, but if you take everything he says at face value you’re going to miss out. Readers who notice the disparity between what he says and what people are actually doing are generally amused. Those who don’t seem to get kind of huffy and are sometimes the source of my oddest reviews. SC: Like many writers, you blog often about the craft. Which three of your posts would you consider essential reading for the newbies out there who are desperately hungry for candid advice on honing their skills? First up is a post on how easy it is to excuse yourself from writing, or do something other than write… and advice on how to combat that tendency. Second is how to get involved in the writing community, which is a must. Third is an article on outlining, which I think even those who prefer to write “seat-of-the-pants” might find useful. I use a sort of liquid outlining technique. By that I mean it’s flexible, not that I imbibe while writing. SC: Describe two aspects about running a small family farm that’ve influenced your prose. HAJ: I spend more time than I ever expected taking care of horses. I don’t actually ride them that often, but I’m around them all the time and I’m around people who ride them, not to mention the equipment required for riding them. It’s given me an appreciation for what’s required of folks for whom horses are a crucial part of daily life, and it’s given me a sense of how horses act and how varied their personalities can be. I guess the second thing is just the never-ending physical labor. For instance there’s one of our horses who just has to reach the grass on the other side of the fence, which means he leans against the top fence rails… which means that eventually he breaks one. Inevitably I have to replace four or five fence rails every year. These are the sorts of things people living in agrarian societies have to spend their days doing, and this and other repairs and duties have given me a healthy respect for the activities as well as an understanding of the mindset and skillset required for them. SC: Will there be any more Dabir and Asim books? HAJ: The short answer is yes, I hope that there will be, but it will likely be through a Kickstarter or my own e-publishing efforts. I am very sad to say that despite some excellent reviews they didn’t sell very well. Readers just didn’t seem to hear about the books, despite all the coverage. Or maybe they just weren’t interested in the time period, or prefer much longer books, or wanted to read about fantasy worlds rather than historical settings with fantasy overlay… or maybe they just didn’t think a white 21st century guy should be writing about 8th century brown guys. I wish to God I knew the real reason. I spent many sleepless nights trying to figure it out. SC: For the following flash questions, try to answer with the first idea that pops into your head. Imagine a prison of eternal misery. Is it hot or cold? SC: If you were only allowed to read ONE book more than once in your lifetime, what book would you choose? HAJ: Toughest question on here, as no book springs to mind lightning fast. Easier to name books I wouldn’t re-read… Hang on. I’m going to go look at my shelves… Okay, probably the Leigh Brackett fantasy masterworks omnibus Sea-Kings of Mars. SC: Stickers on your laptop or pure out-of-the-box plain? SC: Alone at a cafe do you covertly people-watch, check Twitter and Facebook on your phone, or read a book? HAJ: People watching is always interesting, but I don’t do it for long. My phone’s so old I can’t check Twitter or Facebook. I MIGHT be reading a book, but odds are good I have one of my writing notebooks out and am jotting something down. SC: Music while writing, or total silence? And if you chose music, name three inspirations. SC: Thanks for participating in this blog tour! Over at 49th Shelf, Steve Stanton recommended ELEMENTS as a June read. Over at Goodreads there’s another sweepstakes to win a copy of ELEMENTS: A Collection of Speculative Fiction. This time the contest is valid in Canada, the US, Great Britain, and Australia. Carole Gill lives in Yorkshire with her second husband (the normal one) and two lunatic Parson Russell Terriers. As for her writing, she doesn’t know what shaped it or started her off, but she did start writing quite young. She wrote her first story (sci-fi) in the fourth grade. She continued to write but life got in the way as it does sometimes. She turned back to writing some years ago when she was selected by North West Playwrights of England for further development. It was a wonderful experience. 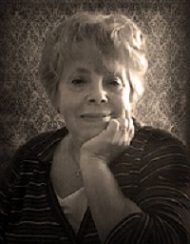 Carole writes all sorts of horror and is widely published in horror anthologies. 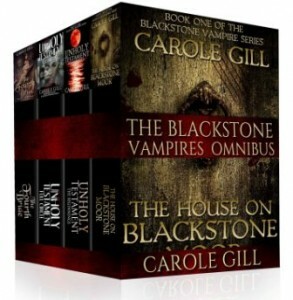 Her Blackstone Vampires Series books are now available in an omnibus. It’s vampire fiction at its darkest. Suzanne Church: Your bio states that your “longer fiction is historically based.” What’s so appealing about the past? Is it because the gothic vampire esthetic is so hauntingly beautiful? Carole Gill: I find the past extremely interesting. I have always loved history and enjoy doing research. Also, I happen to think vampires are very much at home in the past. It seems to be the right setting for me to place them. Some inhabit crypts and abandoned churches but they may also be found in other places. I see them strolling along gaslit streets, staying in the best hotels—generally they prefer small hotels with sea views. I often have them recalling the times in which they lived. I do it because they tell me to. I have written about them existing throughout time. You see, I try to tell their stories. Also, I enjoy placing them in various time periods to see how they cope. I want to know how they functioned through the Black Death what with all those sick people. Where did they get their sustenance from? SC: You’re in the middle of a 52 story challenge. How do you find time to write a short story every week? CG: It’s not easy! There is no time at all, really. But I make time. I write those stories by inspiration. That might come from an old murder case I recall or perhaps my own feelings about something. I tend to make notes and the story evolves from there. Usually I will write it up on Sunday from some sketchy notes. Many of them are darkly comic, with contemporary settings. I’ve even stepped out of my horror in a few of them! I am amazed with what I’ve been writing sometimes. And really, as far as not having time goes, that sort of pressure makes me come up with something! You can keep up with my progress here. The collection of short stories from the challenge will be published by Creativia next year. SC: Describe two aspects about living in Wakefield that’ve influenced your prose. CG: We have also lived near Huddersfield which is not that far from Haworth. I’ve been to the Bronte Parsonage many times and have walked on the moors they walked on. I’ve seen the ruins at Top Withens that it is said Emily Bronte’s Wuthering Heights might be based on. In fact, I wrote a blog post about the experience. There is history all around me in England. That is my greatest influence; castles and moors, ghost tales—and myths. Howling winds, driving rain—not pleasant but boy, can I come up with a story when I hear the wind in the chimney! CG: OMG! Without a doubt, Eco! Eco is a demon. He is my very favorite character. 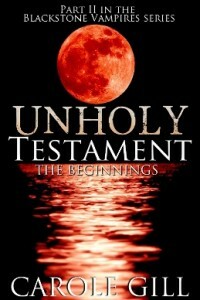 Eco features in two novels, Unholy Testament – The Beginnings and Unholy Testament – Full Circle. He is highly intelligent and as he would tell you himself, he was driven mad because he is. Eco doesn’t delude himself. This story provides insight into the creature that is Eco. 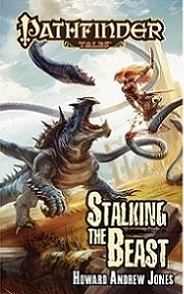 This short story inspired the two novels Eco features in. Eco is capable of vicious evil and outrage. Yet, he can understand and perhaps even feel (for however briefly) compassion. He claims to have loved—I think as far as he is capable, he has loved. Readers can decide that for themselves, though. Yes, Eco–! Without a doubt or any hesitation, I would love to interview Eco! SC: Do you feel as though women writing in horror bring a different perspective to the fiction table? CG: Yes, I do. Women bring in more emotion and thought. I’m not talking about paranormal romance, I’m talking about horror. 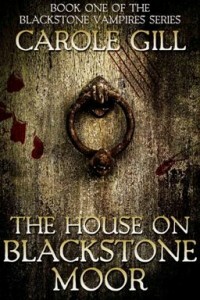 Women, can and do, write horror that is horrifying and dark with other elements as well. Anne Rice certainly has done it. She’s gone beyond nasty, ugly vampires, to giving us vampires that recall living lives—she’s written about vampire children. What is more tragic or thought provoking than that? I recently blogged about child vampires. CG: At this very moment–! While I am typing the answers to your very interesting questions, I am going over my latest novel which begins a new series. It begins at the court of Marie Antoinette, travelling onto harems and freak shows in Europe and Morocco as well as a sultan’s palace. It is much more romantic than my previous books, yet it has its darkness. 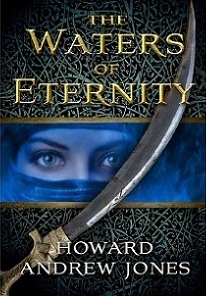 The next book in the series begins in Ancient Egypt and tells of a forbidden love affair. SC: What inspires your fiction? They are my icons—they live in my head and make my heart beat as it does. I am happy to worship them from afar. All I wish to do is be inspired by them and continue to write what I write. CG: I prefer vampires but I see werewolves as tragic as vampires. I think they should have an affinity—as they are both damned. SC: Biscuits or scones with tea? CG: No music while writing, total silence is best for me. CG: So welcome, thank you for having me, Suzanne!